Homecoming is a celebration of Royal Roads’ past and present; it is an event that is open to alumni, ex-cadets, faculty, and staff from Royal Roads Naval, Tri-Services and Military Colleges (RRMC), and Royal Roads University to provide a dedicated weekend for coming home. Homecoming embraces tradition, while welcoming the future. Celebrations are designed as a salute to familiar friendships, class reunions, the forging of new friendships, and pays homage to days past. We hope you’ll join us for Homecoming 2018 to reconnect with your Royal Roads family. For Homecoming 2018, both the Rear-Admiral John Charles Military Museum and the Dunsmuir Museum have undergone a major facelift and will be open for the weekend. Come enjoy these two wonderful museums. In addition, all the Cadet Awards and Honours brass plaques which once were on display in the Grant Block Quarterdeck of RRMC will have been newly installed at the special Royal Roads Military College Memorial area behind the Quarterdeck. and 1978 – their 40th anniversary. Join President Allan Cahoon at the official kick-off to the Homecoming weekend. 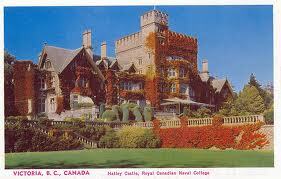 Raise a glass to old friends and new at this reception held within the historic Hatley Castle. Cash bar provided. Please join our inaugural Family BBQ! We intend to bring together ex cadets, alumni and their families to enjoy a fun afternoon amid the ambiance of Royal Roads. There will be great food and lots of fun events for families, including face painting, croquet and dunk tank. People make the person. As such, we would like to provide you with an opportunity to bring your family back to campus to reconnect with your journey here. Our campus patio holds incredible views all year long, but in September it is particularly rich, let’s gather to take in some sun while we enjoy an outdoor BBQ our family and friends can also enjoy. Garden tours will be available and the museums open. What’s a celebration without a fine dinner overlooking the campus? Guests will enjoy a gourmet buffet and an evening of camaraderie. Bring your spouse or guest for an evening designed to provide you with not only an opportunity to connect, but to create new memories on campus. We’ll also be hosting a photo booth for those who fancy a keepsake of their reunion and gathering with friends old and new. In this ceremony we honour Royal Roads’ military history by gathering at the mast in the yard of the former Vice-Commandant’s house for a dedication of paver stones, engraved with the names of Royal Roads ex-cadets and staff. Guests are then led by the Westshore Pipe and Drum band from the mast site to Hatley Castle for a farewell toast and reception. Following the reception, ex cadets are again escorted by the Westshore Pipe and Drum band to walk the ceremonial “circle” that cadets remember running around. Together we’ll re-live memories, and retrace old steps from the Castle to the Grant Block, to the wonderful grounds. It’s our way of paying homage to the education and training provided at Royal Roads Military College, and its dedicated ex-cadets and staff. And it’s our way of coming together as past and present alumni to acknowledge where we came from and where we are going. We hope to see you there. 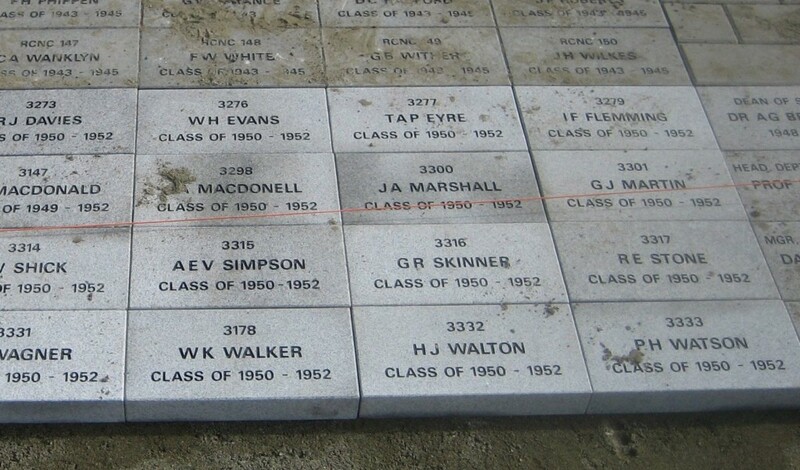 A reminder: The Royal Roads Memorial Plaza Paver Stone campaign is still going strong. The RR ’88 class is, happily, aware of the event with some members already making plans to attend. * Quite possibly the College’s most illustrious class at least during its degree-granting years.